Maximum size: 4 mm (Midway animals to 10 mm). Identification: This is a cream dorid with a notum variably streaked with opaque white. It has a pair of elongate extra-branchial processes and a series of short thorn-like processes lining the notum. The latter vary considerably in length. The rhinophores are simple and both the processes and rhinophores are tipped with orange. 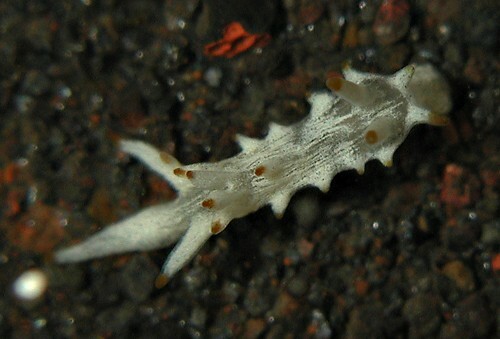 Natural history: Okenia sp. #1 is a moderately common species found in moderately exposed to exposed rocky habitats and Halimeda kanaloana beds at depths of 4-11 m (13-36 ft). One animal laid a crescent-shaped, white egg mass measuring 1.4 mm by 0.5 mm. Photo: CP: 3 mm: Ulua Beach, Maui; Nov. 26, 2004.